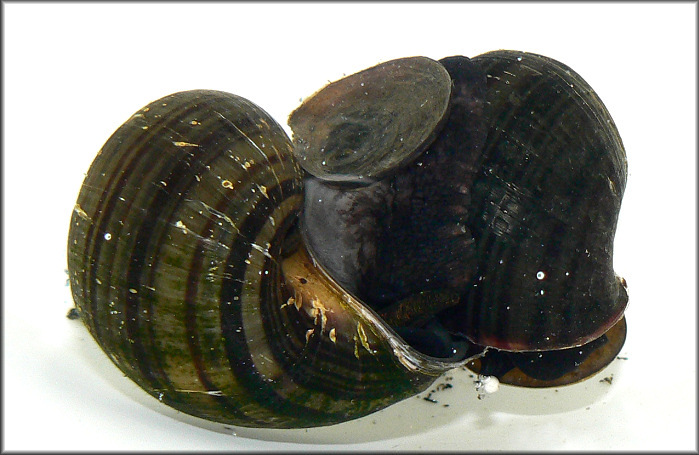 These two Pomacea diffusa (pictured above mating) were collected from separate areas of the drainage ditch near the SAM's club on 5/27/2007 and placed together in a bucket. That evening the two engaged in a long period of mating. Over the next two days during the hours of darkness, the female thoroughly explored all aspects of the bucket in an apparent attempt to find a suitable location to deposit her egg clutches but none were forthcoming. 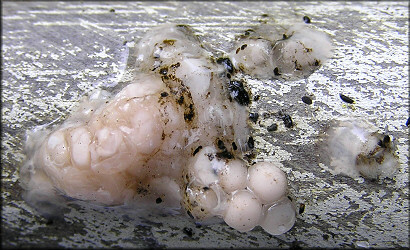 On 5/31/2007 the two mated for a second time (shown above) and during the morning of 6/1/2007 a limited number of non-viable eggs were found floating in the water at the bottom of the bucket (see image below). The male is pictured above on the left and measures 55 mm.